Are they a placemat or a tray? They are both, as the Faux Leather is a stylish placemat when flat, just lift the 'handles' and you have an instant edged tray. 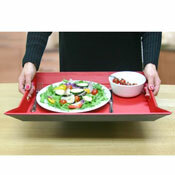 So handy for easy table laying and clearing or carrying a hot plate to your favourite dining spot. Proudly designed here in Wellington by Tradestock, these trays make great practical and stylish gifts for any occasson. Easy to clean, and in reversable colours to suit the mood. This award winning design is a very creative concept and the evolutionary design provides a very individual style in any kitchen or dining setting. Click here to see our selection.